Dr Colin Crosby shares his tips on how to avoid injury whilst skiing. Skiing and snowboarding are both potentially high risk sports in that they are carried out at high speed, with multiple changes of direction, in a very challenging environment, including ice, poor visibility (‘white-out’), avalanches, etc. Even on the well maintained pistes, skiing puts tremendous strain on the ankles, knees, and hips and proper preparation before a skiing holiday is, therefore, vital. The modern rigid ski boot tends to give some protection to the ankle; however, the forces are then transmitted further up the leg to the shin, notably to the knee, where repeated twisting and turning actions can lead to overuse injury as well as acute ligamental tears from falls, especially when the boot bindings are too tight and the ski fails to release. The quadriceps muscles are constantly being worked during a ski run since the knees are always bent and this can lead to severe fatigue and tearing. The inner thigh muscles (adductors) are also at risk as one tries to control the ski during repeated turns. Even within the boot, injuries to the toes and instep are common – particularly with poorly fitting/rented boots. Head and face injuries can result from high-speed falls and collisions with other skiers and for this reason, helmets are being increasingly worn by all skiers nowadays. 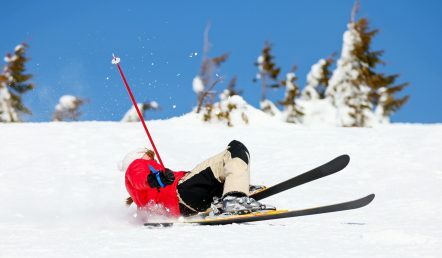 The upper limbs are also at risk in falls, particularly the joint between the thumb and the wrist (1st metacarpophalangeal joint (MCPJ)) when the thumb is forced away from the hand by the loop of the ski pole. A formal ski preparation programme should start at least 6 weeks before the ski holiday and should consist of a gentle cardiovascular warm up routine involving gentle jogging/cycling as well as stretches for the lower limbs, back, neck, and shoulders in order to ensure flexibility during the skiing. Skiing requires a high level of cardiovascular fitness and energy expenditure is always higher at low temperatures. It is important, therefore, to ensure that one’s fitness programme involves high level anaerobic and aerobic training for the lower limbs (leg curls, spinning exercises on a bike, high intensity step machine work, etc). In order to make the programme replicate the actions on skis, jumping exercises such as side-to-side jumps over a low bar and up-and-down jumps to a bench are also very useful. Oryon Imaging offers affordable diagnostic imaging in Central London, with MRI from only £200. Dr Colin Crosby is the Sports and Exercise Medicine Consultant. He is one of the few full time SEM specialists in the UK and has been working in the field for over 25 years. Visit his website here.